You’ve heard about “random acts of kindness” – those good deeds that are done spontaneously and without expectation of a reward. There’s certainly nothing wrong with that. But when you change the “acts of kindness” to “acts of IT,” then it’s a different story. That’s what Claudio Silvestri says he encountered at NAV Canada when he took on the CIO role at the organization in 2012. NAV Canada is Canada’s Air Navigation Service Provider. It manages 12 million aircraft movements per year for 50,000 customers across 18 million square kilometers. Before Silvestri joined, NAV Canada was handling all those aircraft movements adequately, but its IT department was a different story. Projects were taking off, but not landing on target. Employees were onboard, but not really engaged. Critical systems were verging on obsolescence. It took a leader like Silvestri to grab the stick and right the organization’s course. 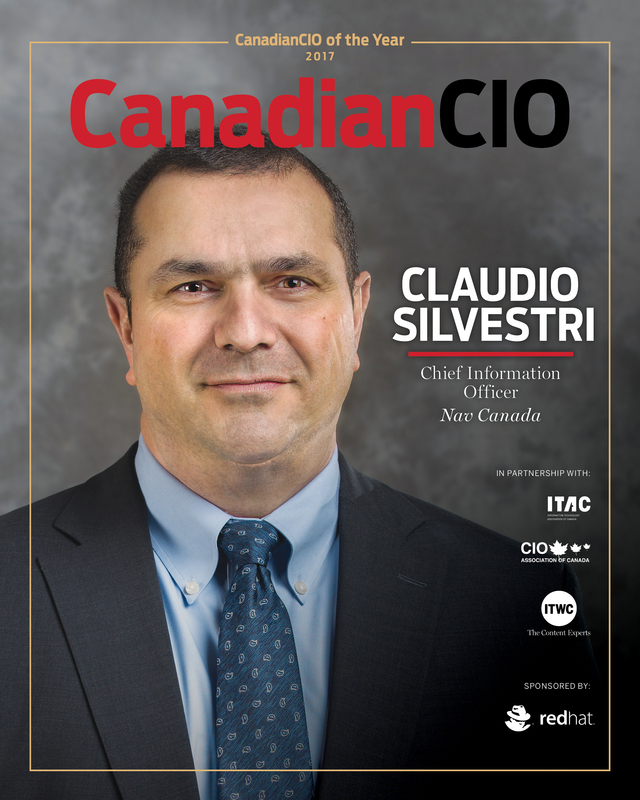 It’s earned Silvestri the honour of the Information Technology Association of Canada’s CanadianCIO of the Year award in the non-profit category for 2017. Not only has he righted the course of NAV Canada’s IT department, but he’s collaborating on a new multi-stakeholder project that has the potential to change the aviation industry. We spoke with Silvestri at NAV Canada’s control tower at Toronto Pearson International Airport. This interview has been edited for length and clarity. CanadianCIO: Here’s how your nomination for CanadianCIO of the Year described the situation at NAV Canada prior to your arrival: a lack of leadership, a lack of key performance measures, and it was viewed as a utility. There were struggles with project delivery and employee engagement was low. Take me back to your early days as CIO at NAV CAnada. When you arrived in 2008, what was your assessment and what were your first priorities? Claudio Silvestri: When I first joined NAV CANADA in 2008, the situation with the IT organization was pretty challenging. There was a lot of good things that were going on, but I think that there were a lot of opportunities for improvement. The company had privatized in late ’96, and their first priority, at the time, was to modernize the air navigation system, and rightfully so. Over the years, they had spent over $2 billion in doing that. As a result, Canadians enjoy one of the safest, reliable, and modern air navigation systems in the world. The focus was clearly on the operational environments, which, again, needed to be done. As a result, the IT organization perhaps didn’t get the right level of attention and priority and funding and resourcing that it may have required. When I joined, they were kind of 10 years into the privatization. The IT organization was providing pretty adequate type services, but there was room for improvement, because the company continued to grow. Realizing that having resolved the air navigation system obsolescence issue, now I needed to change the focus to avoiding the obsolescence issues that were growing on the IT side of the business. One of the first things we did was to analyze the situation in a factual way, to take the emotion out of the situation. We measured our performance in a way to identify the root causes of problems. We were able to demonstrate what we needed, and what value potential could be generated if we made these changes. CCIO: Let’s talk about organizational leadership. You established an IT governance board for your company that includes representation from all business functions. Can you tell us about how you organized this board, why you thought it would help, and how it’s made an impact in the last nine years? CS: A group of people from every part of the organization has been coming together for nine years, meeting every six or eight weeks. We’re looking at performance. We’re looking at policy. We’re looking at what are the priorities that we need to be focusing in on based on the longer-term objectives of the corporation, and it’s really, really made a difference. We’re trying to run a $1.3 billion company. We don’t have an infinite amount of time. People are money. So we really want to make sure that where we do apply resourcing and focus, it’s for the right things. I think the business community, as a result, has really benefited from that. We’ve been able to move quick. We’ve been able to establish platforms that will do many different things, so we’re not investing in individual point solutions. It allows us to scale the organization and be really cost efficient. CCIO: Under your watch, NAV CANADA’s IT department went from an employee engagement of 48 per cent in 2010 to 80 per cent in 2016. Tell me about some of your tactics to engage employees. CS: Had it not been for the fact that we were working on engagement for the past eight or nine years, and in lieu of how fast the IT industry is moving today with things like mobile and cloud computing, I don’t think the results would have been as good as they have. The reason I say that is when we talked about the shift to cloud five years ago and we declared that we’re going to be a cloud-first organization, we were able to do that and, at the same time, commit to our employees and managers that any efficiencies that we would gain by adopting cloud, we would not use them to reduce the organizational capacity. In fact, we would use them to scale the organization, so do more with the same was really the message. This was not about cutting jobs or eliminating services and moving them to outsourced service providers. This was really about driving value back into the NAV Canada business through cloud computing. When we said we were going to be cloud first and we declared the fact that it’s not about eliminating jobs, it’s about focusing our energies on higher value work, people believed it. Any anxiety that people may have felt around cloud computing is that five years ago, there was still a lot of, I would say, uncertainty about what it meant to the industry but also to customers like NAV CANADA. The messaging was all about all the money that it’s going to save people, and that came, in some part, at the cost of jobs. We’ve not seen that, but we have seen the scalability. We’ve seen the ability to shift the IT organization to higher value work. We’ve been able to do a lot more with the same people that we have. We had to retool them, of course. We had new jobs that were established, old jobs that went away, but we’ll be able to move the organization forward. CCIO: Can you tell me anything more about the advantages you see operating in the cloud? CS: As we made the shift to cloud technologies, we were really confident that we would realize a lot of benefit in doing so. Not so much in the hard costs, because cloud technologies, on an apples-to-apples basis, are not necessarily cheaper. From a pure acquisition of technology, we didn’t see a tremendous amount of efficiencies there. However, where we did see the opportunity was the ability to scale the organization by shifting a lot of the routine and the maintenance type activities over to the vendor and allowing the IT organization to focus on the higher value, the more strategic work. At the same time, you can get at stuff that you would not necessarily be able to as fast or in a manner which that you can with cloud solutions. You have to be pretty smart about how you do that. You have to stay true to your core IT strategies and figure out how cloud makes its way into that without compromising your own direction here. I think we’ve been able to successfully do that. As a result, we’ve developed a number of mobile applications that actually service the air traffic controller community. CCIO: How have you overcome any compliance concerns around the aviation industry about working with cloud partners? CS: When you think about IT technologies and how fast things move, when approaching the aviation world with that kind of pace, you have to do it in a manner which doesn’t threaten that core safety approach. Our focus has not been on really thinking about cloud in the context of systems that control aircraft but more in the mode of developing cloud solutions that are in support of that core mission. Things that we’re doing with allowing air traffic controllers to operate in a compliant environment, things that we’re doing to allow for shift management and labor management, things to do with just really the analytical and the performance side of air traffic services. At the same time, really using cloud technologies to enhance our safety management system. We’ve recently shifted over to a brand-new SMS, safety management system, which is cloud-based, and we’re enjoying that. We’re doing that because of the nature of cloud. We’re able to reach the controller population. They’re able to capture events in a more efficient and economical manner, in a more consistent manner. Really, allowing us to see safety occurrences in a manner which we could not do before. CCIO: Final question. We’re very interested in this Aireon project, which is described as a joint venture that will track 1 million aircraft movements per day. Can you tell me about your role in this project and what it means for your industry? CS: Aireon is an amazing opportunity for the aviation industry. It really is going to revolutionize an important aspect of aircraft surveillance on a global scale. Aireon, in partnership with Iridium, is going to be providing global aircraft surveillance capabilities and providing that information to customers like NAV CANADA so that we can avoid very expensive traditional radar type installations. It’s revolutionary in the fact that Aireon will be able to provide, for the first time ever, 100per cent coverage of the Earth’s surface. Today, there’s only approximately 30 per cent positive surveillance coverage. Obviously, it is a dramatic moment for the aviation industry. What it means to folks like NAV Canada is we’re going to be able to use Aireon technology to fill in radar gaps, particularly in the northern communities and in the half of the North Atlantic that we’re also responsible for, and do so in a very economical manner. In fact, increase our safety performance. At the same time, offer a tremendous amount of fuel savings and reduction in greenhouse gas emissions because of the way that we’re going to be able to control and route aircraft once Aireon is up and running. The IT community at NAV Canada has been working with Aireon for the past three and four years to actually build out the global billing system for them. If you can imagine, billing for that type of service is a fairly complicated piece of technology. We’re developing a custom billing system for Aireon which will service their global customers and be able to manage probably somewhere in the order of a million, million and a half messages per day and take those messages and convert them into an invoice, essentially. What that means, really, you’re talking that’s pretty big data, and it’s going to require a certain amount of compute and networking capabilities and be able to scale up or down in real time based on the needs of the day. When we first were beginning to work with Aireon on this billing system and we started to design what that could look like, recognizing that they are, in fact, a big startup company, it became pretty obvious to us that it had to be a cloud-based scenario. After we looked at the market, we concluded that Microsoft Azure was really the best place to begin that work. Actually, it’s been the perfect choice for us, because Azure has really matured over the last three or four years. In fact, continues to mature, and it’s probably one of our biggest challenges, is doing software development on a platform that keeps moving as fast as Azure. We’ve been very successful, and we’re about 12 months away now, actually, from going live with this billing system as Aireon and Iridium complete the constellation. They’re about halfway through right now, and they’re scheduled to be live or be close to going live sometime this time next year. We’ve been working with it for the past three or four years. It’s a remarkable environment, and I think Aireon is actually very pleased that they chose that path, because it is proving to be the right answer for them.